So when Mike decided to pursue his MBA, Washington State University was the natural choice. An active member of the military, Mike was stationed at Dover Air Force Base in Delaware at the time, so the online MBA was a perfect fit. In 2013, Mike was deployed to Kyrgyzstan for active duty. He was directly responsible for the oversight of 4,000 Air Force and Department of Defense civilian requirements valued at $224 million. But those responsibilities didn’t stop Mike from working toward his degree. If anything, he was motivated by the challenge. 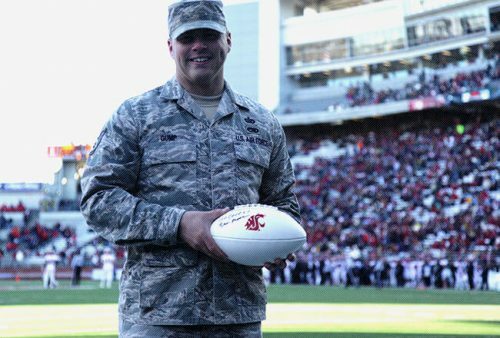 Click here to learn about WSU’s commitment to providing educational opportunities for military personnel and veterans. Today, Mike is a business analyst with Avista Utilities. He is quick to point out the extensive reach of the WSU alumni family. “The Cougar network is vast and almost anywhere you go, you can find a fellow Coug. All the way from corporate execs down to my fellow employees, there is a Washington State alumni around,” he says.